LOS ANGELES – The Los Angeles Kings have signed recently drafted defenseman Erik Cernak to a three-year entry-level contract, Kings President/General Manager Dean Lombardi announced today. The 18-year-old Cernak (born May 28, 1997) is a 6-4, 207-pound native of Kosice, Slovakia who appeared in 43 regular-season games last year with Kosice in Slovakia’s top league and registered 13 points (5-8=13). 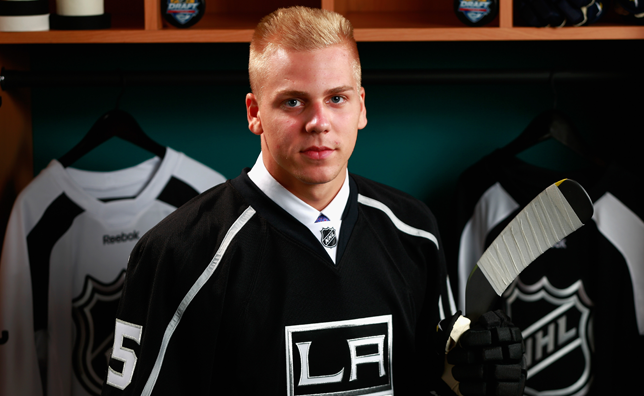 A second-round (43rd overall) selection of the Kings at the 2015 NHL Draft, Cernak has won two league championships with Kosice the last two seasons (2013-14 and 2014-15). He has represented Slovakia in the last two World Junior Championships (2014: 5 GP, 0-0=0, 4 PIM; 2015: 6 GP, 0-2=2, 4 PIM), including earning a bronze medal in 2015. He also competed in the World Junior Under-18 Championships in 2013 (6 GP, 0-2=2, 8 PIM) and 2014 (5 GP, 0-0=0, 6 PIM), serving as the captain in 2014. He was named a Top Three Player on his team in both years. Also in 2013, he represented Slovakia in the World Under-17 Hockey Challenge (5 GP, 0-0=0, 8 PIM) serving as the assistant captain.